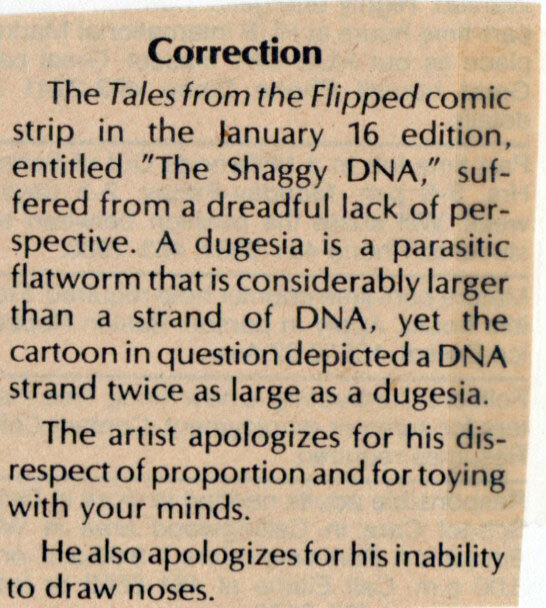 The Tales from the Flipped comic strip in the January 16 edition, entitled “The Shaggy DNA,” suffered from a dreadful lack of perspective. A dugesia is a parasitic flatworm that is considerably larger than a strand of DNA, yet the cartoon in question depicted a DNA strand twice as large as a dugesia. The artist apologizes for his disrespect of proportion and for toying with your minds. He also apologizes for his inability to draw noses.